The Lithuanian Chamber of Commerce in the United Kingdom (LCCUK) held its Annual Christmas Charity Ball at The Berkeley Hotel in London’s Knightsbridge on Thursday 22 November with all proceeds coming to The Tiltas Trust. The event was attended by Lithuania’s recently arrived Ambassador, Her Excellency Asta Skaisgiryte-Liauskiene, as well as by His Excellency Vygaudas Usackas, the former Ambassador to London and now EU Special Representative in Afghanistan. 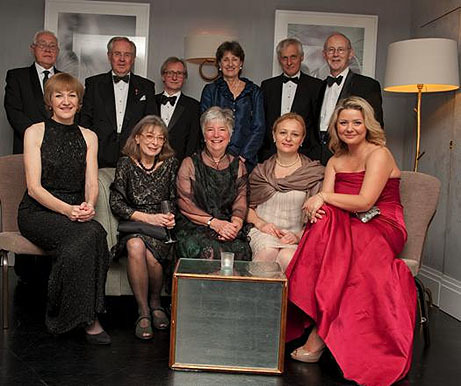 The majority of TTT Trustees attended as well as the Chairman of the British-Lithuanian Society. The presence of Olympic Swimming Gold Medallist, Rūta Meilutyte, highlighted the pride of the Lithuanian community in the achievements of Lithuanian sportsmen and women. According to first reports from LCCUK, over £10,000 was raised for the work of TTT. This will be used to support organisations providing cancer support and palliative care in Lithuania as well as encouraging the increase in volunteering. The recently established umbrella organisation, POLA will receive additional support to help their publication of Macmillan texts in the Lithuanian language. TTT is hugely grateful to the LCCUK and its Members for this valuable endorsement of our policy of discovering and transferring valuable know-how between Britain and Lithuania. A press report on the Ball can be seen at Londoniete.lt, video at lrytas.lt. This entry was posted on Friday, November 30th, 2012 at 1:08 pm	and is filed under Uncategorized. You can follow any responses to this entry through the RSS 2.0 feed. Responses are currently closed, but you can trackback from your own site.